We aren’t that interested in personal purity. Of course we should all try to be good people, but politically it’s more important that we band together and use our power to force political and social change. This can happen in all sorts of different ways, but one of the most time-tested is the strike: workers banding together to fight against the management class. Much labor organizing has been co-opted into a simple struggle for middle-class privilege. But in a city with skyrocketing costs of living, teachers who work their hands to the bone (60 hours a week isn’t uncommon) to try to help the next generation deserve a wage increase. But we’re extra happy to see teachers fighting back against racist standardized testing systems and the school to prison pipeline that disproportionately enforces strong punishments among youth of color in our community. 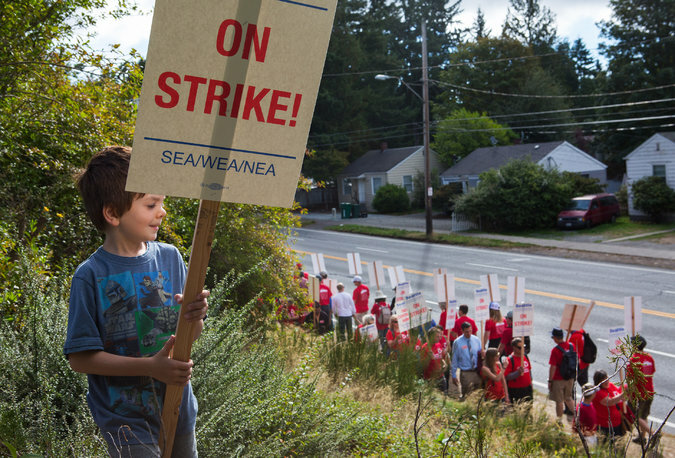 This is the first time that Seattle teachers have gone on a full-on strike in 30 years. Support their work. We need both revolution AND reform. This entry was posted in Noncooperation, People of Color & Anti-racism, Worker Solidarity and tagged Prison industrial complex, Seattle. Bookmark the permalink.